David Levy says he wouldn’t wake up at 5:15 a.m. for just any reason — it has to be a good one. But each week on “exercise days” he rises before the sun and heads for his morning workout at Wake Forest’s Clinical Research Center, a building that, at an hour many reserve for Cheerios and checking Twitter over coffee, glows in the twilight between Piccolo Park and BB&T Field. Graduate student Teagan Avis (MS '15) leads a group, including Walt ('63) and Florence ('63) Wiley, through stretches. One step inside and I can see why. 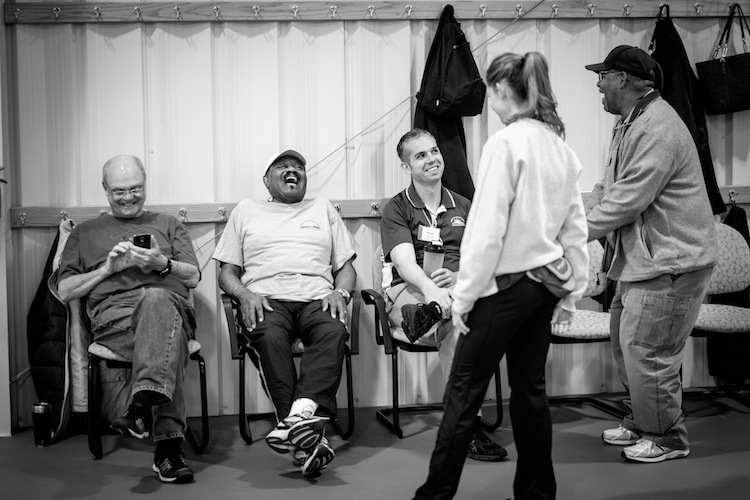 The pre-dawn chill is replaced by warmth, not only of the air but also of the people in this little community powered by the energy of spry earlybirds lifting weights, jumping ropes and logging laps around the indoor track. 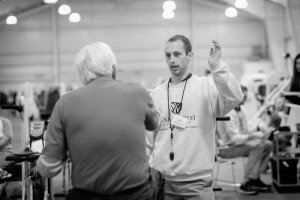 Thomas Becton (MS ’15) supervises a participant’s exercise routine. Mixed in with whirring stationary bikes and a throbbing Michael Jackson beat are sounds of people actually enjoying themselves: greetings, conversations, wisecracks and laughter. Wait. This is a gym, right? Jenny Puckett (’71, P ’00) takes a breather. Sure enough. 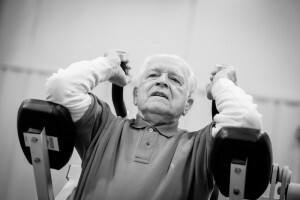 But by all accounts, not just any gym — a gem of a gym that’s home to Healthy Exercise and Lifestyle Programs (HELPS), an established wellness community outreach helping older adults achieve and maintain healthy lifestyles through individualized exercise prescriptions, “filled” not at a pharmacy but by educators in a supportive, friendly environment. It doesn’t take long to determine that faculty and graduate students of the Department of Health and Exercise Science, recognizable as the younger humans with whistles around their necks, are here to monitor vital signs and supervise exercise by those not wearing whistles. The latter would be older humans whose gritty expressions of determination turn to smiles as they successfully complete their routines. I hear words of encouragement and friendly banter between generations, experiencing firsthand what many have told me: what sets HELPS apart is more than a workout; camaraderie and a sense of belonging are as integral to wellbeing as stretches and weight circles. 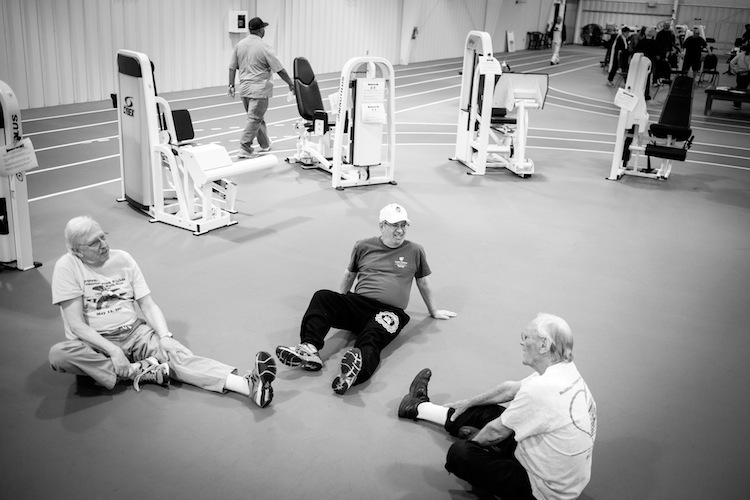 David Levy, center, shares a workout and some conversation with Jerry Smith, left, and Billy Shelton. 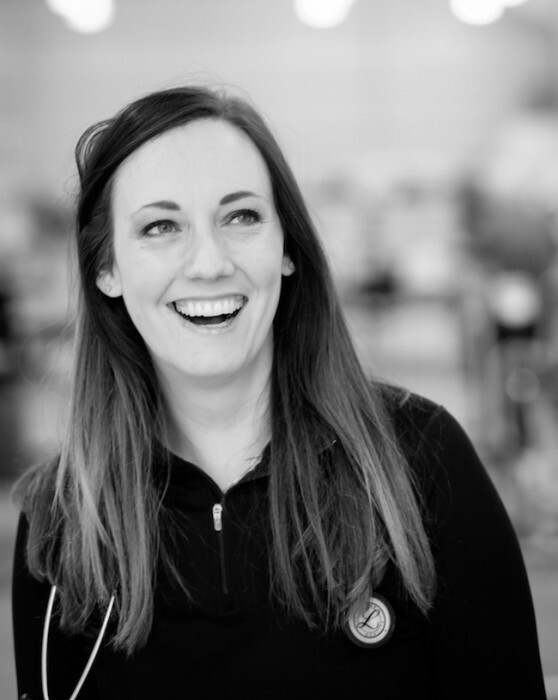 "It's not the exercise … it's the COMMUNITY." WAIT. This is a gym, RIGHT? Enjoying time out for some socializing are (left to right) Rick Cornwall, Jim Shaw, graduate instructors Phillip Cox (MS '15) and Tara Richardson (MS '16), and Bernard Van Eaton. Peter Brubaker (MA ’86), right, HELPS executive director, chats with participant Bill Letts. On this particular morning I take to the track, wondering how obvious it will be that I haven’t walked an actual lap in an actual gym, well, since exercise was just a twinkle in these graduate students’ eyes. Along the route I take note of huge rotary fans, bouncy balls and monster stopwatch-style clocks that help walkers monitor their heart rate. Finally I see something to which I can relate: a table stacked with CDs including the Fabulous ’50s, the Drifters and a nonstop disco mix. I approach 80-year-old Ralph Massey as he circles the track and ask if I may walk alongside him. He charmingly introduces himself as Tom Selleck and says he joined the program at 75. As I struggle to match his pace by synchronizing our steps to the beat of “Billie Jean,” Massey tells me he grew up on a dairy farm and is no stranger to getting up with the chickens. He’s had some past health issues and just wants to take care of himself. His story inspires me to put more spring in my step. Lindsay Tise, in his 90s, is a regular at the morning workout. Then, as if there is anyone else in the gym, who, like me, may not yet be fully awake, a rousing call-to-attention gets the job done. The music stops and gym activities come to a halt as the group gathers for 7:15 a.m. announcements, led today by a confident and composed graduate student who could easily be the child or grandchild of many of us not wearing whistles. Ninety-something Lindsay Tise reports he played in a senior golf tournament over the weekend and took the gold medal in his age group, besting a 78-year-old. The group erupts in cheers and applause. “Get ready for the healthy-eating challenge over the holidays,” says one of the staff members; his friendly reminder is met with more than a few good-natured groans and chuckles. "It's like having 100 extra Grandparents." While HELPS reaches into the Winston-Salem and surrounding communities, there’s a healthy presence of Wake Forest faculty, retirees and alumni, so any given session is sort of like old home week. Former Dean of the College Tom Mullen (P ’85, ’88) often walks laps with John Reed (’58, MD ’62), a retired School of Medicine physician and faculty member who once played basketball for Coach Bones McKinney. Across the room I recognize Elinor Starling, whose late husband, Bill (’57), was director of undergraduate admissions for many years. Jenny Puckett (’71, P ’00), retired Spanish professor who still travels the country telling the Wake Forest story, was there, as were the dynamic duo of Florence (’63) and Walt (’63) Wiley, wearing signature Deacon colors. HELPS participants and staff gather at the motor home of Florence (’63) and Walt (’63) Wiley for the Homecoming 2014 party at BB&T Stadium. The Wileys take a break from their morning regimen to tell me they’ve been HELPS stalwarts for decades; the interaction with young people and a sense of belonging gives them reason to get out of bed every morning. 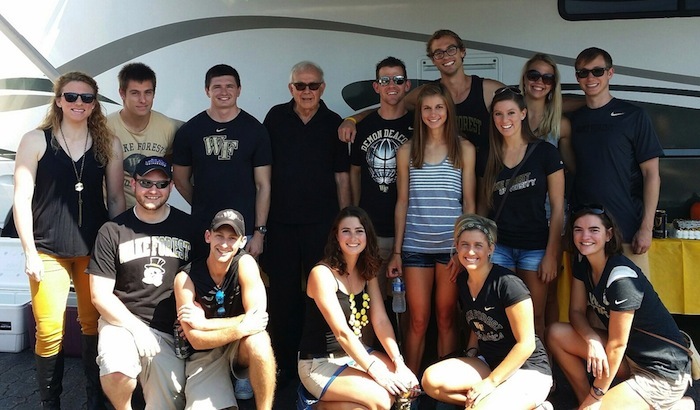 At Homecoming last fall they decked out their motor home in black and gold and invited graduate students, staff and their families to a tailgate at BB&T Field, complete with a Deacon cake. Just like a family get-together — because it was. It’s about this time that graduate student Thomas Becton (MS ’15) peeks into the room — a subtle reminder that he’s watching out for the Wileys and it’s time for them to get back to exercising. I witnessed a whole lot of effort during my morning at HELPS, and I heard nary an excuse. I left, invigorated by a few laps and inspired by new friends. After just a couple of hours in the gem of a gym, my wellbeing was on its way to being more well. 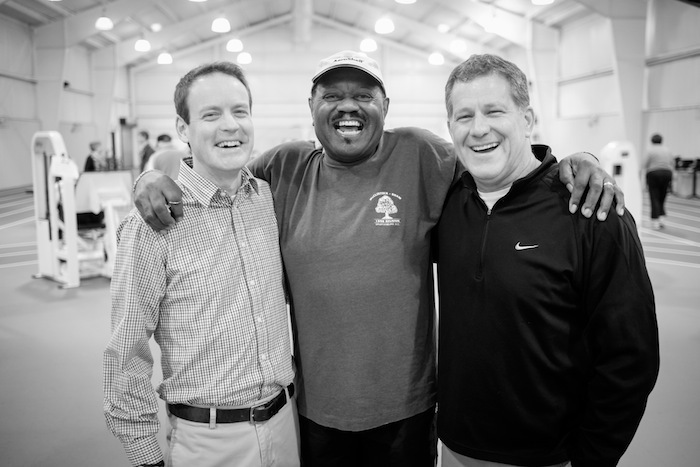 "From a science perspective we know physical activity is beneficial to health, but even more powerful is the feeling of connectedness …"
Peter Brubaker (MA ’86) (right) with former graduate student Dave Edwards (MS ’93, left) and participant Jim Shaw. 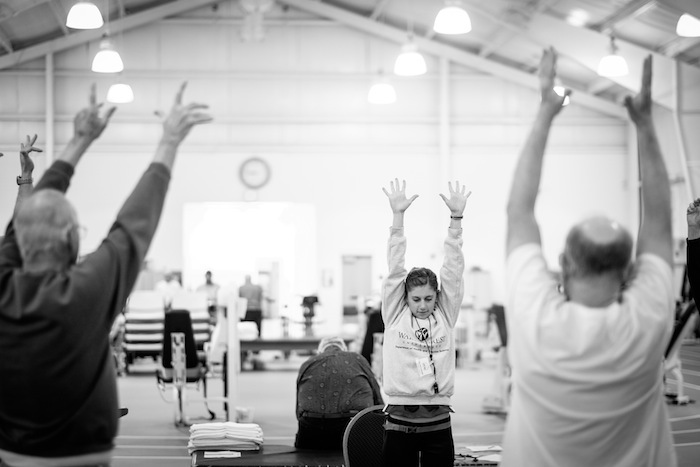 The Healthy Exercise and Lifestyle Programs (HELPS) is an established component of Wake Forest’s community wellness outreach. 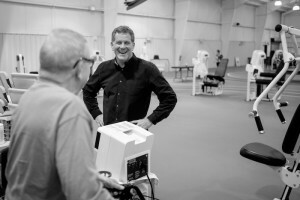 It evolved from a traditional cardiac rehabilitation program, for patients with a history of cardiac events, to a more preventive chronic disease program addressing growing problems of obesity, diabetes and sedentary behavior. 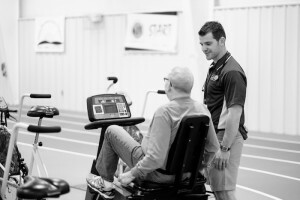 Medically directed and supervised by faculty and graduate students of the Department of Health and Exercise Science, HELPS assists adults in preventing chronic disease through “exercise prescriptions” and education programs. Other benefits include a social component and cross-generational camaraderie that enhances workouts and relationships. David Levy has been ‘with the program’ since 1993. 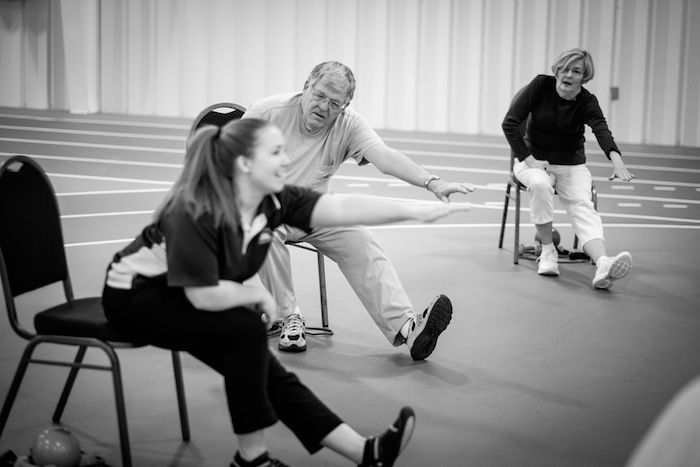 Those who enroll have an initial fitness and health assessment that enables staff to determine safe and effective exercise levels, risk factors and individual goals. Other benefits include nutritional analysis/consultation, access to a weight management program and the option to attend morning or evening sessions. 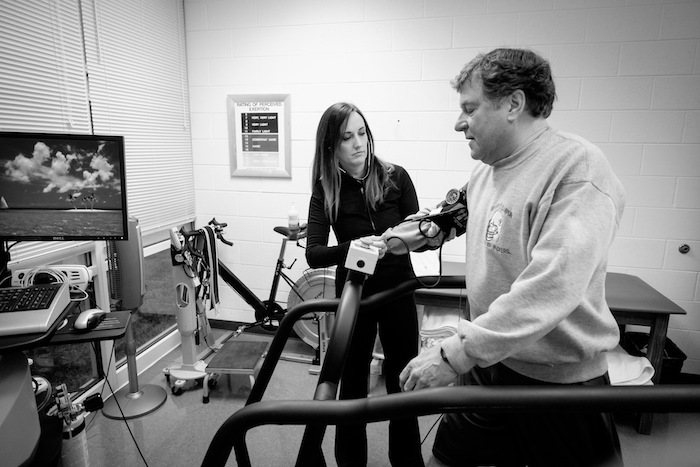 Program Director Jordan Irwin (MS ’06) monitors John Gardner on the treadmill. HELPS participants sign up on their own or may be referred by a physician. The exercise program is $50 a month; Cox says some insurance companies cover the cost of membership or a percentage of it. Regardless of health conditions, all participants undergo a preliminary health and fitness assessment in order to screen for underlying medical problems and to generate an individualized exercise prescription. 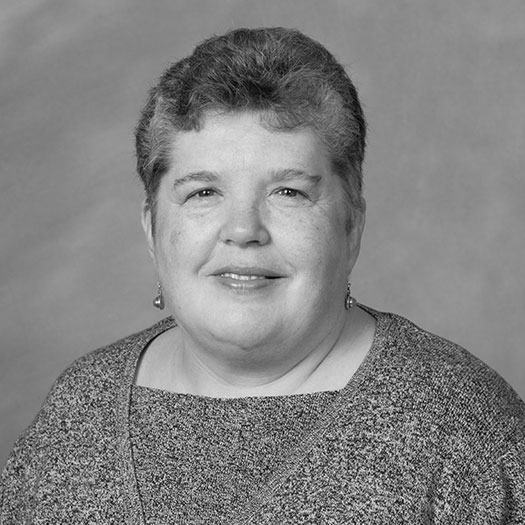 Several years ago the University’s Department of Human Resources contacted Brubaker about developing a wellness program targeted specifically to current employees. “We said sure, that would be wonderful,” he says. The result is a modified HELPS program called Therapeutic Lifestyle Change, or TLC. 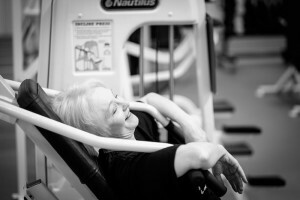 It’s a 12-week crash course on healthy lifestyles integrating classes with supervised exercise and nutrition components. 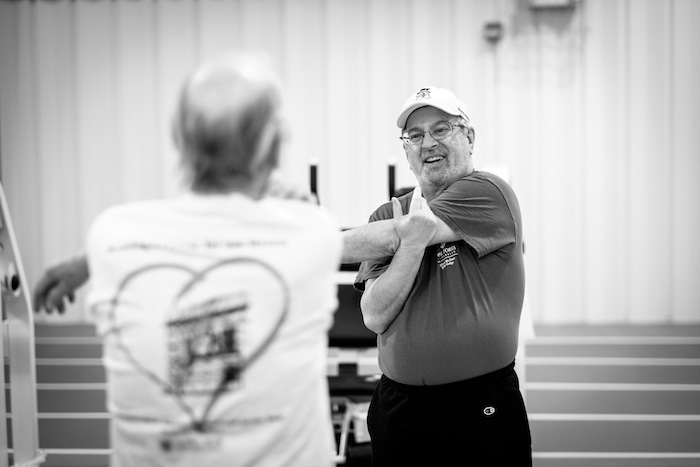 As with the HELPS participants, TLC participants also go through a preliminary health and fitness assessment for screening purposes.